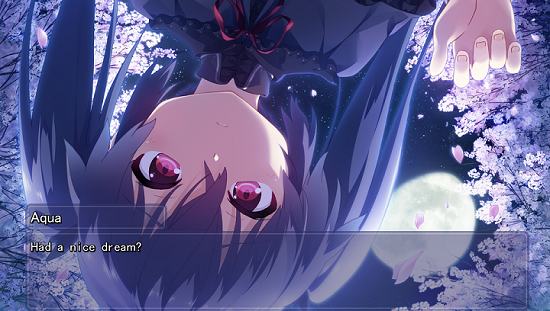 Himawari has an enforced reading order, something you don't see a lot in galge without a strong plot focus. However, like other visual novels such as Fate/Stay Night can use it to drive the plot and themes forward in parallel tales, so too does Himawari use it to give us ample context for all the characters and insight into them before then putting them in situations that we can understand better having already spent so much time with them. 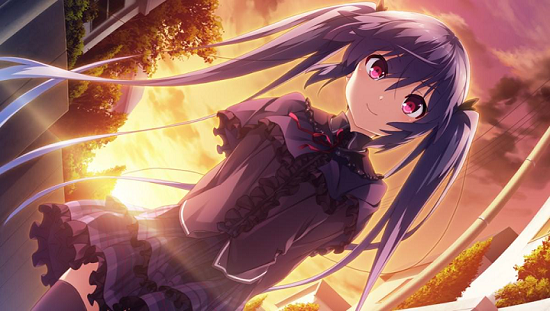 Himawari does this in a pretty direct fashion with Aqua: the first regular route introduces her to us as a side character, then we go back into reading an entire flashback chapter from her perspective, and then we unlock her route in the main game. 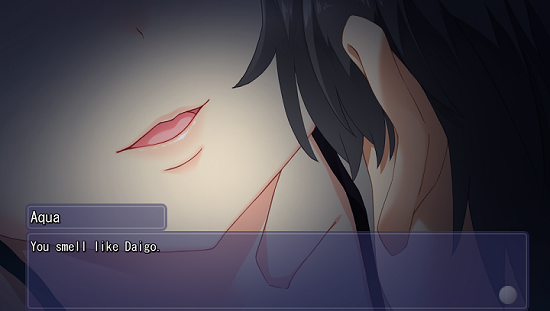 The first route doesn't tell us all that much about her. She seems pretty cool and knowledgeable at first, then she pukes the main character in the face. She plays more or less the straight man to the other's comedy, while still being totally weak to cuteness herself. A quirky and fun side character, who of course also shows to be a reliable ally during the climax, but never taking center stage. Then we get to 2048, the flashback chapter, and for the first time we really get to see how Aqua views the world. 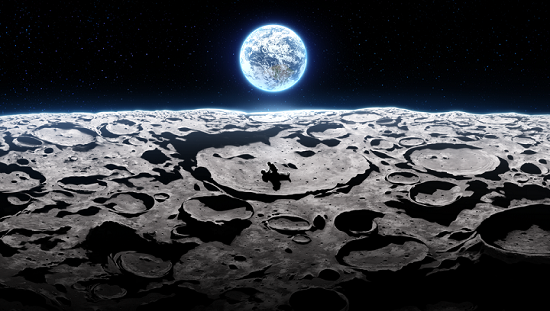 We see her lonely, isolated life on the Himawari space station, how she comes to develop a crush on the 'hero' who randomly shows up and stays in her room, and how she's faced with expectations of being someone else and not herself, expectations she cannot fulfill. Because 'she is a failure'. We see her hoping for something greater, and then watch those hopes being dashed to pieces as she ultimately plays the role of another to give someone their desired ending... with nothing left for herself. And we go through all of this before reading her route. I need to re-emphasize this. Most galge give you a girl's backstory halfway through their own route at best. 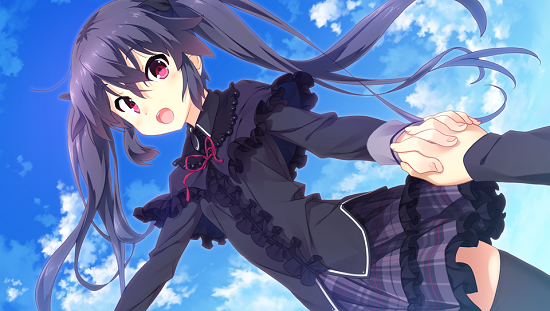 Grisaia no Kajitsu for instance always builds up some drama at first, gets you asking yourself why the girl would be acting the way she does, before doing the big flashback reveal and then resolving things in a neat way. Himawari says smurf you to all that and gives you all the context you need to get or at least be able to reasonably guess at what is going through Aqua's mind in just about every scene in her route. And this allows the visual novel to do so much more. The scene where Aqua makes out with Youichi while calling him Daigo before freezing and leaving as he calls her 'Aoi' is so powerful because we already *know* how much it hurts Aqua to be called by that name. We don't need to be told that. We directly saw what she went through. And whether this knowledge we have has lead us to understanding her is put fully to the test in this route's choices. 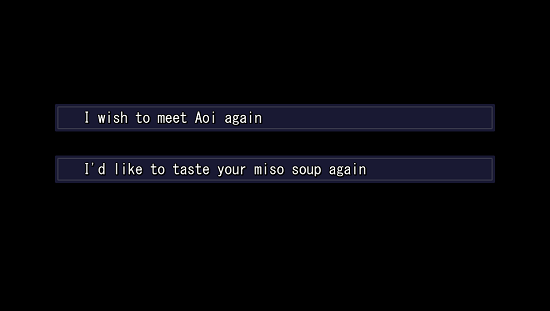 The choices in Aqua route can be pretty damn unforgiving at times if you're just reading this VN casually and trying to get to the good end. There's quite a few instances where you might feel like both options have their merit; but if you understand everything that's going on then you may just realize why one ultimately does lead to everything falling apart. Aqua and Youichi are both people that have been left deeply scarred by having lost the one they love before. They both tried to have the other be their replacement. And they get into conflicts along the way. And those conflicts, depending on what answers you give, can easily have everything fall apart. The route also builds on what the first route more or less left there as a hook, which was that there was no clear resolution. Yes, Youichi forgave Aries for what she did, but Aries could not truly forgive herself. He was no magical savior for her. Aqua route continues this trend. 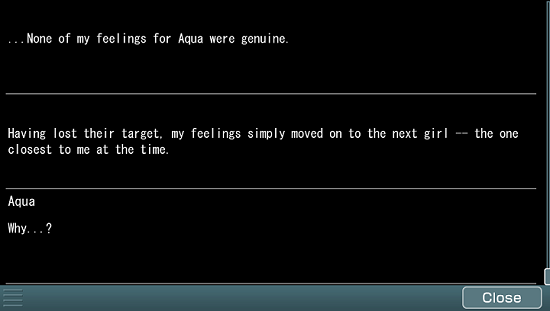 Youichi cannot magically solve all of Aqua's problems for her. They're not that simple, and Youichi also has his own issues to deal with on top of that. Even very late into the route you are still given the choice to abandon Aqua, to accept the illusory happiness Aries presents you with. And even when you choose not to, the game only goes on to confront you with the fact that Youichi cannot do what Youichi cannot do. But even as two broken people they can still be there for each other. 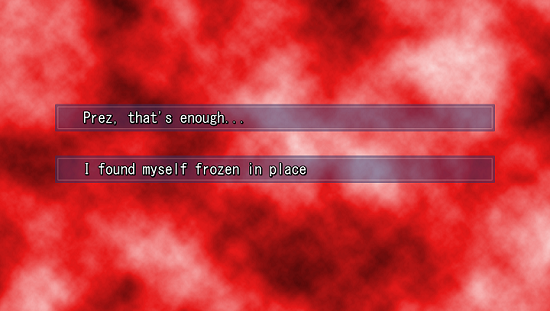 It only recently hit me how rare this kind of thing really is in visual novels. To have a story centered around a relationship between two characters that aren't ideal for each other and still long for someone they lost, a pair that fights and genuinely doubts each other, but where ultimately both parties still want to be with each other. And Himawari does it while also having already given us all the pieces to understand all sides of the equation. 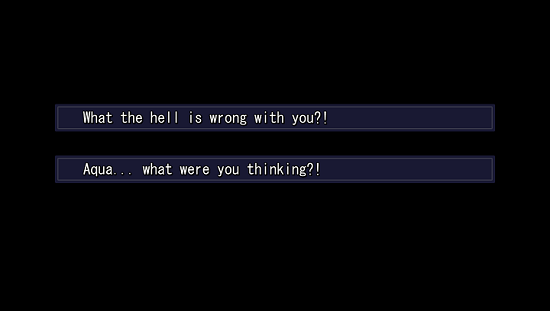 I'd like it if VNs did this sort of thing more in general. If reading this makes you think of any others that do something similar, please do let me know.